To maintain your events and activities just create reminders for them. 2) The local notification information will be shown. Notifications about private or business events. Tracking of event completion, by recording notes for every completed event or activity. 1) One-time events –reminder about something what need to be done defined date and time. 2) Daily, one or couple of times per day – requiring events with repetition pattern based on days. 3) Weekly events – requiring events with repetition pattern based on weeks. 4) Monthly events – requiring events with repetition pattern based on moths. 5) Yearly events – requiring events with repetition pattern based on years. In RemindIt app has been implemented total saving/restoration of state – it means that app might be interrupted at any time (by phone call, pressing one of device buttons, screen lock) and your data will not be lost. When app is activated next time you will have option to get your latest data back. App behavior might be customize by modification of settings – just press ”settings button” and adjust app parameters. 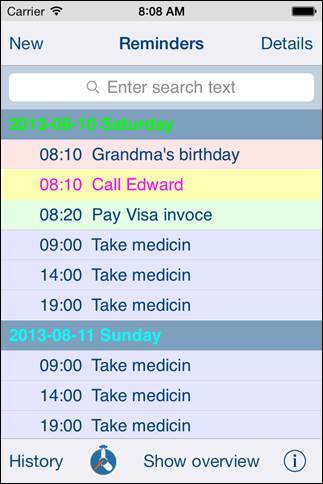 All app activities and events are recorded in system log and statistics.